Do butterflies keep growing after their birth ? What is the caterpillar’s main activity ? What are the two main roles butterflies play in nature ? Can you name some of the reasons why butterflies disappear ? Do different species of butterfly mate with one another ? How many species of butterfly are their in the world ? More than 10 000, more than 50 000 or more than100 000 ? 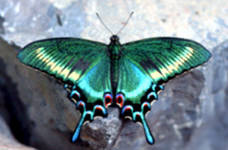 Are the largest species (a wingspan of over 20 cm) butterflies or moths ? Do you know at least one or more varieties of domestic butterflies ?